Many marine invertebrates undergo indirect development, a kind of life history that includes a larval stage distinct from the adult. Two types of larval development are distinguished based on the source of larval nutrition. Lecithotrophy, meaning “feeding on yolk”, refers to development with a non-feeding larva, which depends on the egg’s yolk reserve supplied by the mother. Planktotrophy, meaning “feeding on plankton” refers to development via a larva that must feed in the plankton in order to develop to metamorphosis. Species with planktotrophic development produce many small energy-poor eggs with adequate nutrient reserves for the development of a feeding larva. These larvae must begin to feed immediately upon acquisition of feeding structures since they rapidly deplete their relatively insignificant yolk stores. Lecithotrophic species, on the other hand, produce fewer but larger eggs. These large yolky eggs develop into non-feeding larvae which usually lack feeding structures (e.g. mouth, gut, ciliary bands for capture of food particles). Lecithotrophic larvae spend comparatively less time in the plankton, and begin to feed after metamorphosis. Here, I pictured eggs of two sea star species with contrasting development. 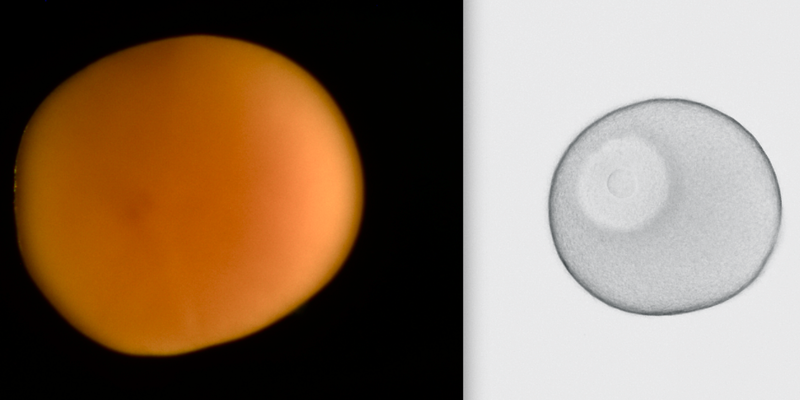 The opaque orange egg on the left (~1.2 mm in diameter) belongs to Mediaster aequalis, a lecithotroph, while the relatively transparent oocyte on the right (~150 µm) belongs to Pisaster ochraceus, a planktotroph. This picture depicts a 3-week old pluteus larva of Dendraster excentricus (sand dollar) which develops from a 125 µm egg and exemplifies planktotrophic development. Planktotrophic larvae, like this pluteus, have a functional gut, and one can often see food in their stomachs. Note several green single-celled algae (Dunaliella) inside the larval stomach. Feeding larvae typically spend weeks to months in the plankton before metamorphosis. This larva has begun to form the juvenile rudiment - an unpaired sack-like structure visible between two of the larval arms on the left side of the image. This is also the left side of the larva, which is viewed from the dorsal side (anterior at upper left). With plenty of food Dendraster plutei may reach metamorphopsis after 3-4 weeks at ambient sea temperature. The last picture depicts a wild-caught lecithotrophic doliolaria larva of Cucumaria miniata a local species of sea cucumber, that develops from large yolky eggs (~ 500 µm). Its planktonic development lasts only about two weeks and the larvae lack the capacity (and the need) to feed.